Endoscopy has been used as an investigation method in the diagnosis of benign and malignant lesions of the upper aerodigestive tract (UADT) for many years. Conventional white light (WL) has certain limitations in the detection and evaluation of small lesions. Narrow-band imaging (NBI) is a new optical image enhancement technology using light, centered on 415 mm (blue light) and 540 nm (green light), having a high affinity for hemoglobin. Blue light penetrates the mucosal layer, while the green light penetrates deeper layers, thus accentuating the arterioles and venules of the submucosa, leading to a better understanding of the morphology and architecture of the intrapapillary capillary loops (IPCLs). IPCLs are end capillaries with a diameter of seven-to-ten microns and sometimes show the flow of red blood cells on high-definition monitors when visualized on NBI. The IPCLs are situated close to the basement membrane; thus, any inflammatory process or early malignant change affects its morphology. Muto et al. reported the use of NBI with magnifying endoscopy in the identification and surveillance of superficial squamous cell carcinoma of the UADT. Watanabe et al. reported the use of NBI in the detection of early laryngeal cancers. The diagnostic criterion of malignancy which he followed was the presence of well-demarcated areas with scattered brown spots in the lesion [Figure 1]. The sensitivity and specificity for the diagnosis of malignancy by means of NBI were reported as 91.3% and 91.6%, respectively. The present study was done to analyze the vascular pattern on NBI in laryngeal tuberculosis (TB). The normal vascular pattern of vocal folds consists of capillaries in lamina propria, arterioles, and venules in the deeper layers. A prospective study was done at the Department of ENT of a tertiary care hospital between January 2015 and December 2016. An ethical clearance was obtained before the initiation of the study. The patients between the age of 18 and 65 years, of Both gender, affected by symptoms such as hoarseness of voice, breathing, or swallowing difficulty after consenting for the study, were assessed with WL endoscopy. Variable findings were noted such as hyperplastic lesion, edema, and ulcers involving the larynx and hypopharynx. Biopsy was taken under topical anesthesia as an outpatient procedure from those suspected of having a neoplastic lesion on endoscopic assessment. TB was diagnosed on histopathological analysis of the specimen from nine patients. NBI examination of the larynx and hypopharynx was done on these patients. The vascular pattern of the lesions was studied based on the descriptive guidelines of the European Laryngological Society (ELS). 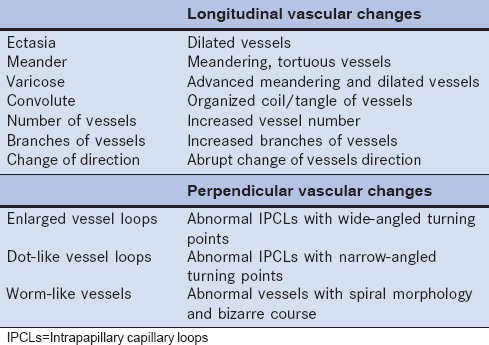 The ELS committee on endoscopic laryngeal imaging has divided the vascularity into longitudinal and perpendicular vascular pattern. Longitudinal vessels reach the vocal folds from the ventricular folds and show a meandering course on reaching the lateral edge of the vocal folds. The changes in these vessels in various diseases of the larynx are enumerated in [Table 1]. Once the diagnosis of TB was established, the opinion of a pulmonologist was sought and antitubercular treatment was initiated. The patients were followed up initially on a weekly basis and later monthly by WL and NBI endoscopy. The mean age of the patients was 45 years. The presenting symptoms were as follows: voice change (n = 6), breathing difficulty (n = 2), and difficulty in swallowing (n = 1). 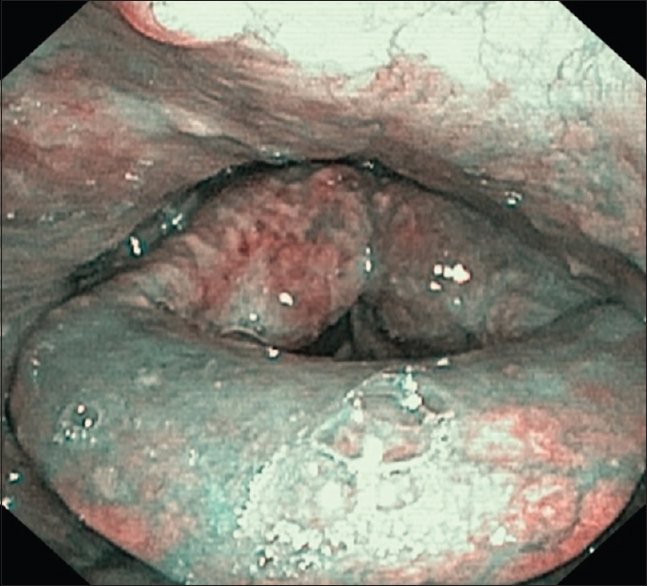 The endoscopic findings were variable among the nine patients: hyperplastic lesion over the vocal folds (n = 4) [Figure 2]; glottis-subglottic edema (n = 2); granulation tissue with ulcer over the vocal folds (n = 2) [Figure 3]; ulcer over the vocal process of arytenoids and interarytenoid regions (n = 3); and ulcers involving right pyriform fossa (n = 1). On NBI, the ulcers appeared brownish scattered lesions not raised from the surface and granulations appeared raised from the surface and were brown or cyan colored. Hyperplastic lesions were cyan colored and had ill-defined margins. On follow-up, reduction in the size of ulcer, granulation tissue, and capillary diameter was observed on examination with NBI. The use of NBI in the evaluation of malignant lesions has been studied extensively, but its role in the assessment of benign lesion has not been studied much, except for a few studies, namely an article by Lukes et al., laryngeal papillomatosis. The present study was done to analyze the vascular pattern on NBI in laryngeal TB. NBI examination of the premalignant and malignant lesions demonstrates perpendicular vessels branching off vertically from the horizontally running capillaries. The IPCLs are situated close to the basement membrane; thus any inflammatory process or early malignant change affects its morphology.,,, IPCLs are small and on WL endoscopy are seen as red dots, whereas on NBI, they appear as brown dots. In tubercular lesions, the changes are observed mostly in the longitudinal vessels. The capillaries appear thin and elongated at the margin of the lesions. They either end abruptly or change their direction at the margin. From the findings of this study, it can be deduced that an absence of perpendicular vascular changes in tubercular lesions is the most important point of differentiation from premalignant or malignant lesion. WL endoscopic examination of the tubercular lesion might give an impression of malignancy, but observation under NBI helps to differentiate the two. Our study also showed that tubercular lesions lack brown dots and worm-like vascular pattern but have thin-caliber longitudinal vessels. The lesions of the pyriform fossa are painful, and there will be pooling of saliva. Laryngeal TB accounts for <1% of all TB cases. Laryngeal involvement may be primary or secondary to pulmonary TB. Earlier studies showed that TB mainly involves the posterior half of larynx, but recent studies indicate predilection for vocal cords (50%–70%) followed by false cords (40%–50%), epiglottis, aryepiglottic folds, arytenoids, posterior commissure, and subglottis (10%–15%). In our study, two cases with lesions near the anterior commissure and one in pyriform fossa were seen. TB of the larynx and hypopharynx should be suspected in cases presenting with dysphagia and odynophagia mimicking a hypopharyngeal carcinoma. According to Shin et al., laryngeal TB may be categorized into four groups: (a) whitish ulcerative lesions, (b) nonspecific inflammatory lesions, (c) polypoid lesions, and (d) ulcerofungative mass lesions. In the present study, two participants presented with ulcerative lesion on true and false cords. The possibility of TB should be considered when a bilateral and diffuse laryngeal lesion is seen without destruction of the laryngeal architecture. Granulomatous lesions create a clinical diagnostic dilemma in differentiating from premalignant or malignant lesions of the larynx on WL endoscopy. NBI is a useful tool in such cases. Few studies have been done to evaluate the role of NBI in benign laryngeal disease. NBI examination allows the physician to think differently in terms of other benign inflammatory diseases while assessing a patient with suspected laryngopharyngeal malignancy. Inoue H. Magnification endoscopy in the esophagus and stomach. Dig Endosc 2001;13:40-1. Muto M, Katada C, Sano Y, Yoshida S. Narrow band imaging: A new diagnostic approach to visualize angiogenesis in superficial neoplasia. Clin Gastroenterol Hepatol 2005;3:S16-20. Watanabe A, Taniguchi M, Tsujie H, Hosokawa M, Fujita M, Sasaki S, et al. The value of narrow band imaging for early detection of laryngeal cancer. Eur Arch Otorhinolaryngol 2009;266:1017-23. Piazza C, Cocco D, Del Bon F, Mangili S, Nicolai P, Peretti G, et al. Narrow band imaging and high definition television in the endoscopic evaluation of upper aero-digestive tract cancer. Acta Otorhinolaryngol Ital 2011;31:70-5. 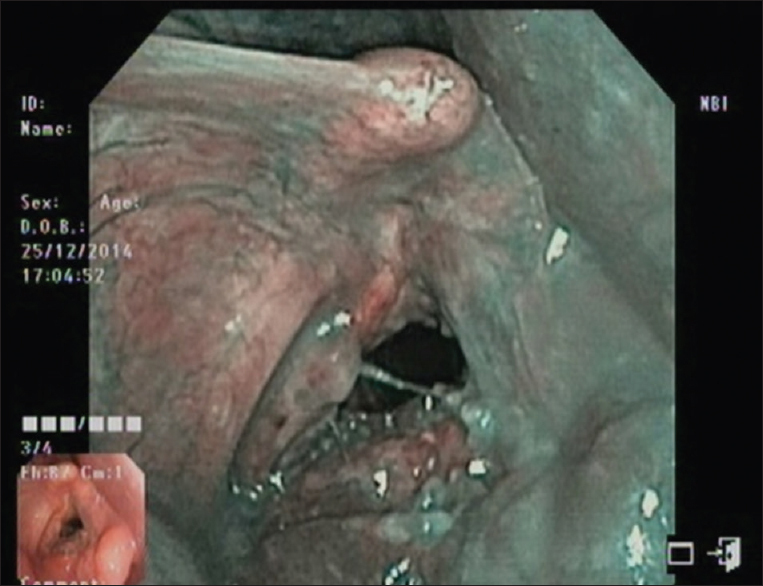 Piazza C, D Bon F, Peretti G, Nicolai P. ‘Biologic endoscopy’: Optimization of upper aerodigestive tract cancer evaluation. Curr Opin Otolaryngol Head Neck Surg 2011;19:67-76. Shinozaki T, Hayashi R, Ebihara M, Miyazaki M, Daiko H, Saikawa M, et al. 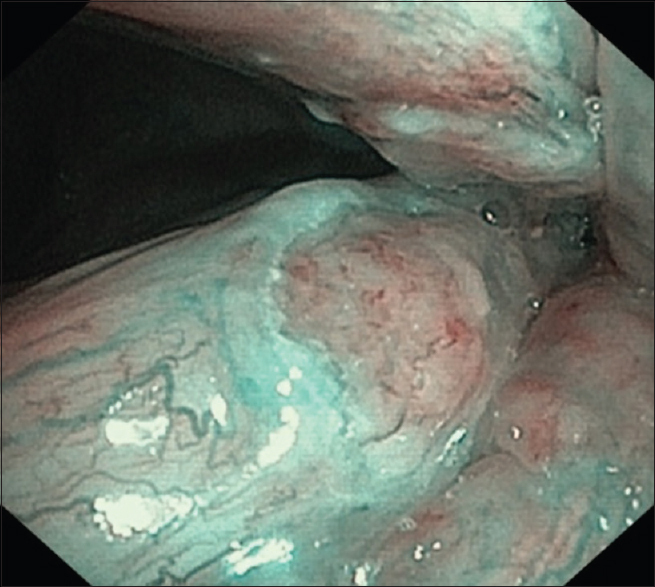 Narrow band imaging endoscopy for unknown primary tumor sites of the neck. Head Neck 2012;34:826-9. Arens C, Piazza C, Andrea M, Dikkers FG, Tjon Pian Gi RE, Voigt-Zimmermann S, et al. Proposal for a descriptive guideline of vascular changes in lesions of the vocal folds by the committee on endoscopic laryngeal imaging of the European Laryngological Society. Eur Arch Otorhinolaryngol 2016;273:1207-14. Lukes P, Zabrodsky M, Lukesova E, Chovanec M, Astl J, Betka JA, et al. The role of NBI HDTV magnifying endoscopy in the prehistologic diagnosis of laryngeal papillomatosis and spinocellular cancer. Biomed Res Int 2014;2014:285486. Egeli E, Oghan F, Alper M, Harputluoglu U, Bulut I. Epiglottic tuberculosis in a patient treated with steroids for Addison's disease. Tohoku J Exp Med 2003;201:119-25. Kandiloros DC, Nikolopoulos TP, Ferekidis EA, Tsangaroulakis A, Yiotakis JE, Davilis D, et al. Laryngeal tuberculosis at the end of the 20th century. J Laryngol Otol 1997;111:619-21. Ling L, Zhou SH, Wang SQ. Changing trends in the clinical features of laryngeal tuberculosis: A report of 19 cases. Int J Infect Dis 2010;14:e230-5. Verma SK, Verma SK, Sanjay. Laryngeal tuberculosis clinically similar to laryngeal cancer. Lung India 2007;24:87-9. Shin JE, Nam SY, Yoo SJ, Kim SY. Changing trends in clinical manifestations of laryngeal tuberculosis. Laryngoscope 2000;110:1950-3.